DISCLAIMER – This guide is in no way meant to advocate the use of illegal drugs; it exists solely to spread an important pocket of knowledge that might have the potential to save lives, or at the very least, trips to the hospital. There is currently too high a risk for the uninformed novice to mistake a poisonous mushroom for a psychoactive one, and so it is my hope that this article helps illuminate the otherwise dark and mysterious pursuit of magic mushroom identification. DISCLAIMER #2 – I do not have magic mushrooms (or any other illegal substances) in my possession. I destroy all evidence of this rewarding (but sadly illegal) hobby by means of digestion. Every year in Victoria, Australia, between the cold months of April to August, magic happens. This magic reveals itself in the form of psychoactive mushrooms. They grow wildly in parks, playgrounds, creeks, forests, nature strips and garden beds They thrive pretty much anywhere with wood chips, tanbark, or mulch that gets a lot of rain and shade. Of course, there are lots of poisonous doppelgängers out there, so it pays to have a bit of experience in identifying the right ones. This ‘experience’ is something we have acquired over the past five or six years of picking and eating magic mushrooms, and so this guide is written with the hope of sharing that knowledge with others. Why buy a man a fish when you can give him a fishing rod, right? This guide will attempt to explain how to find magic mushrooms on your own (or with friends), and outline some good methods of drying and storing them. Page 1 – How to identify Psilocybe subaeruginosa mushrooms (this page). Page 2 – Typical growing locations. Page 3 – List of non-active mushrooms, with pictures. Page 4 – The drying process. Page 5 – The ‘monster’ patch. Page 6 – Some useful links. 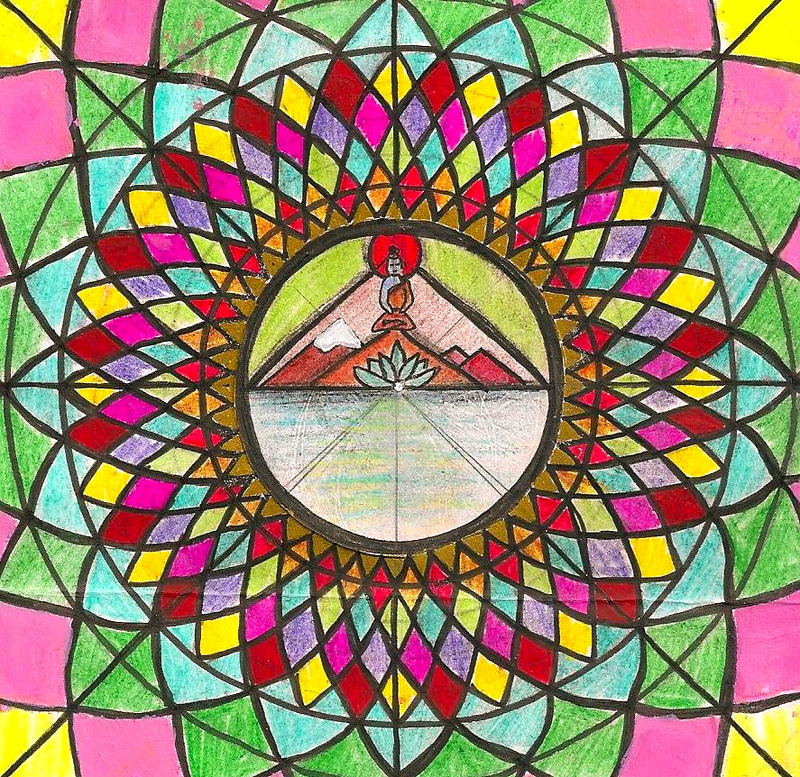 I drew this mandala after a long meditation, and decided I wanted to draw the Buddha. The image of the Buddha meditating on a mountain top came to me in a mushroom hallucination in Indonesia a year or so prior. I was having a bad trip and my cousin decided to show me some yoga to help me snap out of it, I watched him carefully and attempted to follow the yoga positions and immediately felt the bad trip dissipate; it was as though the negative feelings were a small, tight ball of energy, and the yoga helped release it more evenly throughout my body. Even with my eyes closed I could still clearly see my cousin showing me the postures, in the blackness a super vivid image of a holy man meditating on the tip of a mountain appeared, I then flew inside his body and became him; I could hear the wind whistling around me, and then I was the mountain top, finally I opened my eyes and was me again. I’ll never forget that moment.